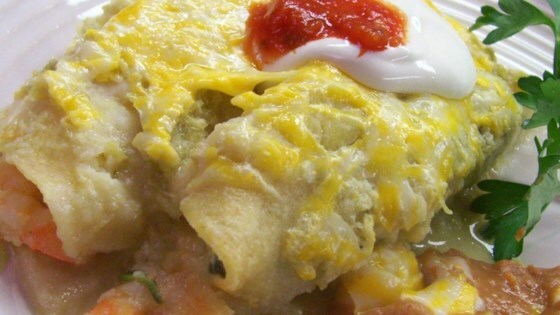 "These enchiladas are a rich, tangy spin on more common red chile enchiladas. Don't be shy about experimenting with fillings and the spice level." Preheat an oven to 400 degrees F (200 degrees C). Lightly oil a 9x13 inch baking dish. Place jalapeno peppers, tomatillos, green onions, quartered onion, and cilantro in a food processor. Pulse until mixture is coarsely chopped, about 8 pulses. Pour mixture into a saucepan over medium heat and bring to a simmer; cook about 5 minutes. Stir in cream and chicken broth; season with salt and pepper. Return to a simmer and cook until slightly thickened, about 10 minutes. Set aside. Place shrimp and spinach in a skillet over medium heat. Cover tightly and cook until spinach wilts and shrimp are heated through, about 3 minutes. Remove from heat. Wipe skillet dry and pour in 1 teaspoon of the oil; heat oil over medium heat. Place a tortilla in skillet about 10 seconds; turn and heat on second side about 5 seconds to soften for easier handling. Fill tortilla with a tablespoon of the shrimp and spinach mixture and about a tablespoon of shredded cheese. Repeat with each tortilla adding more oil to the skillet as needed. Place filled tortillas snugly in prepared baking dish. Pour sauce over tortillas and sprinkle with remaining grated cheese and any remaining filling. Top with dollops of sour cream and some green pepper sauce, if desired. Bake in preheated oven for 15 to 20 minutes or until hot and bubbly. These scrumptious shrimp enchiladas are perfect for a weeknight meal. The best thing about these enchiladas is the sauce. So tangy and delicious. Fresh tomatillos are so yummy. It did take longer to make than the recipe stated, though, so budget a extra half hour. The best enchiladas ever!!! 5 stars . you guys have to make it. i add just and some crab and it taste better. Very good and easy. The trick is the sauce!!!!!! This was wonderful - my husband normally dislikes cilantro, but he loved these enchiladas. The only change I made was that I did not have tomatillos, so I left them out--scrumptious. This is really good! I love the chunky veggies with the cheese and shrimp. I added a little extra spinach because I had it and love it. I cant wait to try the leftovers for lunch!